Tested for compatibility with the Raspberry Pi, our nano bluetooth USB Dongle v2.0 is compatible with both newer V2.0 (up to 3.0 Mbps) and the old specification V1.2 Bluethooth devices. This nano bluetooth dongle can be used to get your Pi interacting with all your bluetooth devices, such a headsets, notebooks, PDA's, handheld PC's, Digital Cameras, Printers and Mobile Phones. This is the most up to date version of the nano dongle currently available - make sure you're not caught out with older one's which might not work! Designed with space saving in mind, this Bluetooth Dongle measures 2.2cm x 2 cm. Warning: We are waiting for confirmation but it seems that these dongles all have the same Mac address meaning two or more of them can not be used in the same room. This should not be a problem for the general customer whom uses one dongle to connect to several other different types of devices. ESP-12F: breakthrough design. The new four-layer board design, the new revision antenna RF performance optimization, compared to the communication from the ESP-12E increased by 30% to 50%! Semi-hole chip technology, the whole IO leads, with metal shielding shell, has passed FCC & CE & RoHS certification, built-board PCB antenna, 4M bytes Flash. We can not offer any support at this stage on this item, sorry for the inconvenience. We don't offer any support, please note that before you buy it !! and power management module. The entire solution takes up the least amount of printed circuit board area. power and RF properties best, which is safe, reliable, and perfect for a variety of applications. This Ultra Long Range High Gain 5dBi USB WiFi Dongle is great if you're connecting to distant WiFi signals with your Raspberry Pi, and want a little more range! We've tested the signal in an open area to a useable straight line range of 100m. We probably would have got more if it wasn't for those pesky tree's! Our long range Raspberry Pi WiFi dongle utilises the plug and play Ralink RT3070 Chipset, which requires no set up or installation on Raspian, XBMC or OpenElec. It's larger than the other dongles we sell, but it features an external 5dBi High Gain detachable antenna to give you a wireless reception range 6 times wider than that of a standard 54Mbps USB Adapter; and subsequently access to distant and weak WiFi signals! Even with all that power, these dongles are low draw (<150mA nominal draw), and connect to the Raspberry Pi's USB via a short USB/Mini-USB cable without the need for an external USB hub! Plug & Play - Requires No Installation. Can be used straight from the GUI via the WiFi Config Program. Plugs into the Raspberry Pi via a USB to Mini USB cable - Requires No External Power. 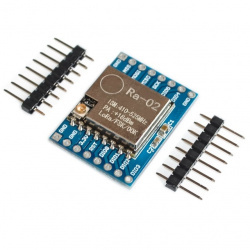 Ra-02 is a wireless transmission module based on SEMTECH's SX1278 wireless transceiver. It adopts advanced LoRa spread spectrum technology, with a communication distance of 10,000 meters. It has strong ability of anti-jamming and has the function of air wake-up Consumption. Can be covering thousands of people in the district environment, particularly suitable for meter reading, smart home, burglar alarm equipment. 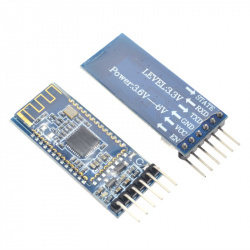 The LoRa series module Ra-01 is designed and developed by AI-THINKER Technology. The SX1278 RF module is mainly used for long-range spread spectrum communication. It can resist Minimize current consumption. Thanks to SEMTECH's patented LoRa ™ modulation technology, the SX1278 has a high sensitivity of -148 dBm with a power output of +20 dBm, a long transmission distance and high reliability. At the same time, compared with the traditional modulation technology, LoRa ™ modulation technology has obvious advantages in anti-blocking and selection, which solves the problem that the traditional design scheme can not consider the distance, interference and power consumption at the same time. This small size Bluetooth 4.0 TTL transceiver module allows your target device to communicate with your iPhone/iPAD, IOS 6 or Android 4.3 devices. It's easy to use and completely encapsulated. You can set it as slave or master. You can use AT command to set the baudrate.